Marrying a burgundy velvet blazer with Mira Mikati navy jeans is a nice choice for a laid-back ensemble. Black suede pumps will bring a sense of sultry elegance to your ensemble. 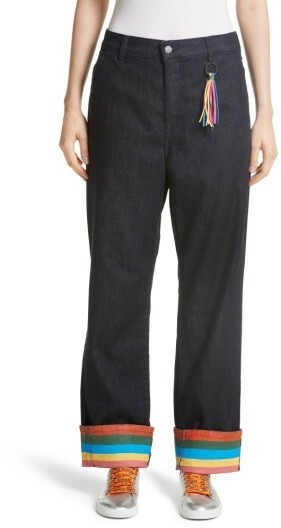 If you like comfort dressing, wear a black leather open jacket and Mira Mikati Ribbon Cuff Wide Leg Jeans from Nordstrom. For a sleeker twist, why not add black suede ankle boots to the mix? When comfort is above all, this combo of a grey plaid wool double breasted blazer and Mira Mikati Ribbon Cuff Wide Leg Jeans is a no-brainer. A cool pair of black suede over the knee boots is an effective way to upgrade your outfit. 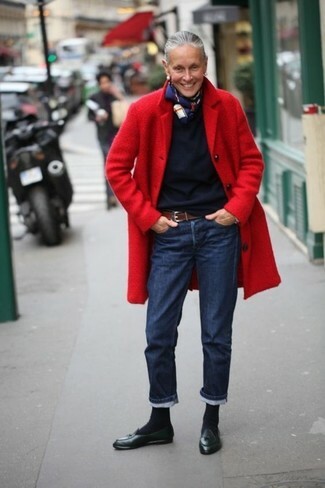 Reach for a red coat and Mira Mikati Ribbon Cuff Wide Leg Jeans and you'll be ready for wherever the day takes you. 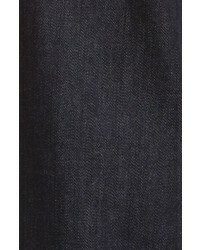 Our favorite of a great number of ways to finish off this outfit is a pair of black leather tassel loafers. This off-duty pairing of a brown military jacket and Mira Mikati Ribbon Cuff Wide Leg Jeans can only be described as strikingly chic. For maximum impact, add a pair of black leather lace-up flat boots to the equation. For a winning casual option, you can't go wrong with this combination of a black and white horizontal striped long sleeve t-shirt and Mira Mikati navy jeans. Send an otherwise all-too-safe outfit in a more informal direction by wearing a pair of red leather ballerina shoes. If you're scouting for a relaxed casual yet totaly stylish look, consider teaming a dark green leather biker jacket with navy jeans. 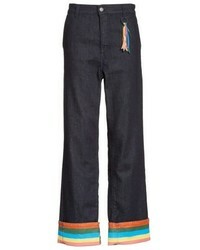 If the situation allows casual styling, you can easily opt for a blue denim jacket and Mira Mikati Ribbon Cuff Wide Leg Jeans from Nordstrom. Tan suede ankle boots are guaranteed to give an added dose of polish to this outfit. A beige trenchcoat and Mira Mikati Ribbon Cuff Wide Leg Jeans from Nordstrom matched together are a total eye candy for those dressers who love ultra-cool styles. All you need now is a great pair of burgundy leather ankle boots.